This walk is available to download from Amazon's Kindle store as an ebook - take the route description with you on your Kindle or other mobile device. Start: SD 829 159. This is a large layby opposite Owd Betts on the A680. Route: click here to view the route superimposed on GoogleEarth (GoogleEarth must be installed on your computer in order to view - click here to download GoogleEarth). Very varied: mostly along very clear tracks and paths, but there are parts where there is no visible path on the ground. We completed the walk after at least a week with no rain, but still came across very muddy patches. There is much industrial archeology to be explored (Cheesden Brook provided power for no fewer than 15 mills and employment for 2,000 workers in the first half of the 19th century). 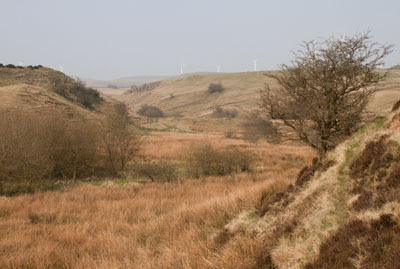 Although the remains of mill ponds, mills and housing can still be seen, the route also a takes in variety of moorland and woodland: we came across two deer above the woodland. Most of the slopes are gentle, with the exception of one steep uphill section which has steps. There is an extensive network of paths in the area, allowing the walk to be easily shortened or lengthened. 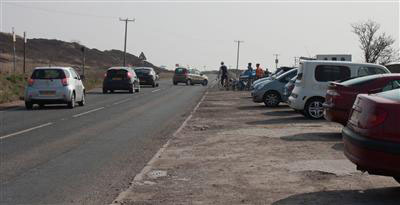 Refreshments: There is often an ice-cream van parked in the layby (which also serves hot drinks and sandwiches). 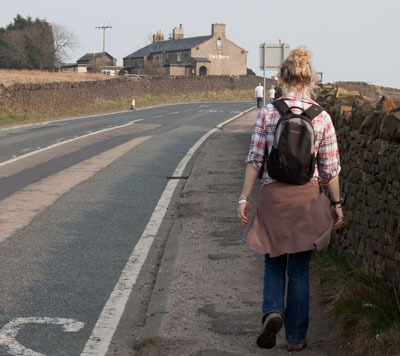 Owd Betts Inn provides hospitality and refreshments from noon every day of the week. The menu ranges from soup and sandwiches to full meals. 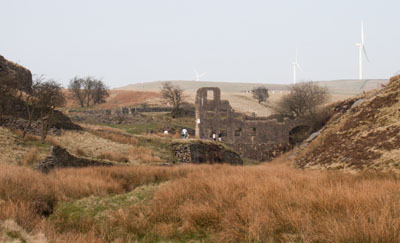 From the wide layby, walk in the Rochdale direction. Just before a left hand bend in the road, follow the footpath sign (and the line of overhead power cables) on the right. The path crosses the wide drive of a renovated farmhouse. Cross Ashworth Road and continue ahead along footpath beside stone wall. The path widens, and becomes better surfaced after passing farm buildings on right. Where the track forks, turn right, following a bridleway sign. The path curves to the right and heads downhill to a metal gate or stile (we chose the gate - the stile was rather dilapidated). After just over 300 metres pass through another metal gate and cross a track. 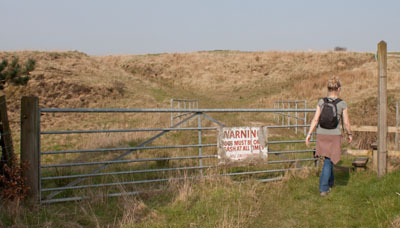 Continue to walk ahead, following the sign Restricted Byway. Shortly after passing between renovated farm buildings follow the track round to the left (ignore the footpaths ahead and to the right). Turn right where the track forks, heading for Marcroft Gate Farm. 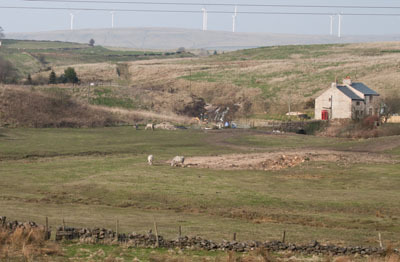 Continue between farm buildings and then turn left opposite a whitewashed cottage. 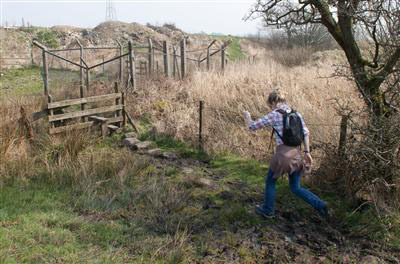 Climb stile to the left of a metal gate and walk ahead along a grass track. At the far end of the field, cross wooden stile on left. 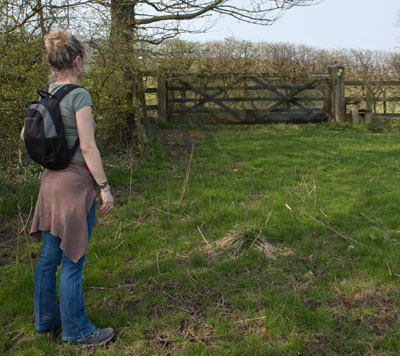 Follow the path along the side of the field to cross another wooden stile. Cross stream and turn right to cross yet another wooden stile. The path continues high above a wooded stream to pass through a gate. Beyond the gate the path is less clear - but continues above the stream, following the line of trees on the right. Head towards a single stone gatepost and then turn right. 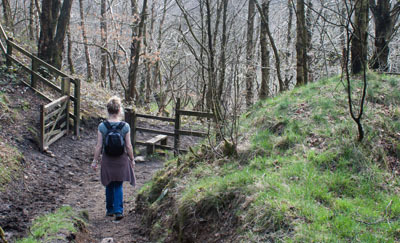 Head down towards the stream, through a gap in the wooden fence (which was probably once a stile). 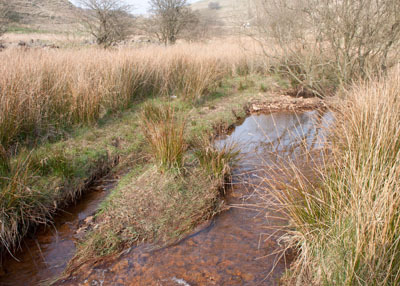 Cross the stream using stones and climb the opposite side of the valley. 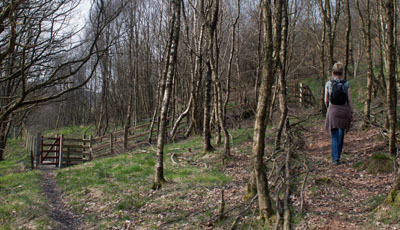 The path turns to the left and leads to a wooden gate (this path, although clear on the ground, is not marked as a right of way). Continue through the gate and then to double metal gates which bring you on to Ashworth Road. Turn right to walk along the road. 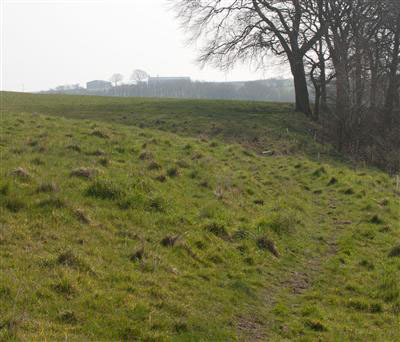 Where the road bends sharply to the right, take the bridleway on the left. 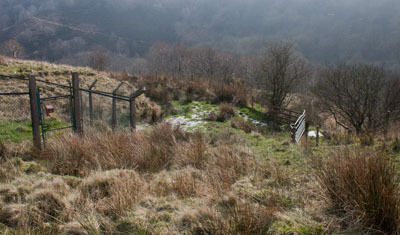 At the end of the field climb a stile to the right of a wooden gate. Continue to follow the clear track until it divides. Take the right hand fork, which fords the stream, then turns left, to follow the course of the stream (though the path descends much more gently than the stream, which tumbles down a waterfall). Pass through wooden gate (or stile to the right). The path bends to the right and descends quite steeply. 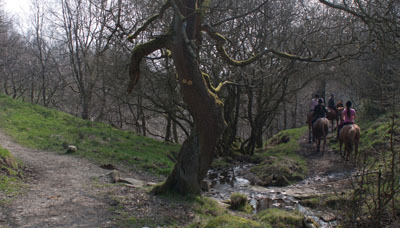 At the bottom of the hill, the bridleway crosses Cheesden Brook, but our route stays to the north of the brook. The path is steep, climbing back up the northern side of the valley, with steps in places (but there is a very low bench to rest on at the top of the steepest section). Where the path divides take the right hand branch to go through the upper kissing gate. The path is not always clear on the ground as it passes between trees, but it is marked by a series of short wooden stakes. There are also further benches by the pathside. Where the path emerges from the woods turn left to climb gently up the side of the reservoir embankment. 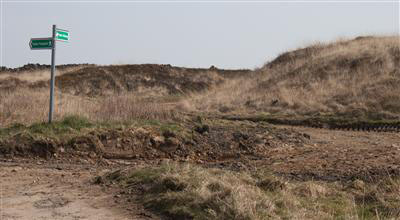 The path between gorse bushes had been recently cleared. There are splendid views in all directions from the reservoir embankment. Cross a wooden footbridge over the reservoir overflow, then turn right onto a clear track. 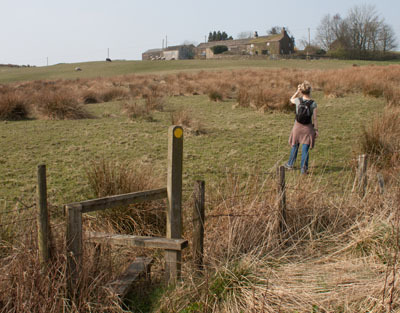 After about 60 metres, leave the farm track, climb a stile on the left and head towards Leaches Farm. 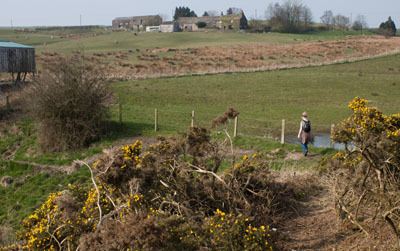 The footpath leads left of the farm buildings to the gate and stile pictured. Cross the stile followed shortly by another stile and then turn left. 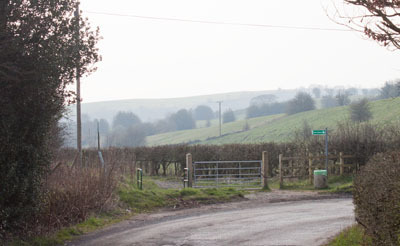 The track takes you through a metal gate and past farm buildings on right. The track turns 90° to the left in front of a barn. The right of way leads through a number of gateways at Cockhouse Farm, however the farmer (who was just coming out of the barn) invited us to walk around to the left of the farm, following the wall. He had obviously given this advice to others before us, as there was a well worn path. 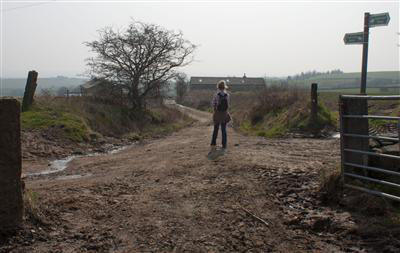 Once either through or round the farm buildings the path is unclear. We headed down towards a pallet used as part of the wire and post fence ahead. Once we were closer to the fence, we realised that we needed to cross the fence lower down. We followed the fence down to a metal gate. Once through the gate, we followed a clear path which followed the contours along the valley side. The path we followed was not marked as a public right of way - but was the clearer route on the ground, and although it was muddy in places, probably avoided even muddier sections of the paths marked as rights of way. It was on this part of the track that two deer crossed the path ahead of us (much too quickly for me to take a clear photograph). There was plenty of evidence of deer, with their footprints in the muddy sections of the path. 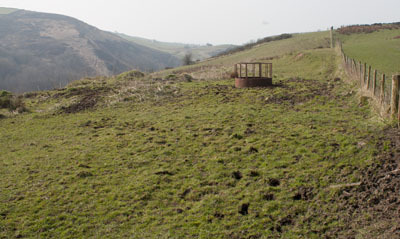 ... to the west of the reservoir below Deeply Hill. 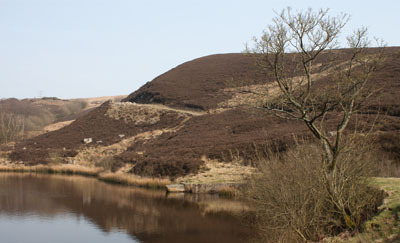 The track climbs to overlook the reservoir. At the top of the rise there was an obvious track to the left, however we continued ahead and down to a stile in the stone wall. 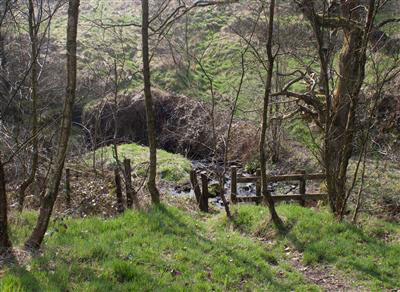 The path followed the curve of the stream to a stile just left of a bridge. 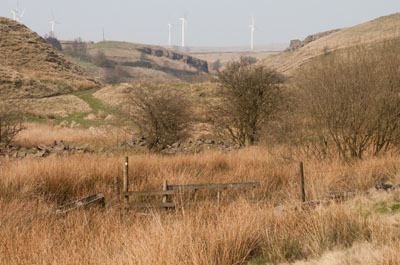 Once over the stile turn left and follow the track up the embankment of another reservoir. Turn right to walk along the dam. 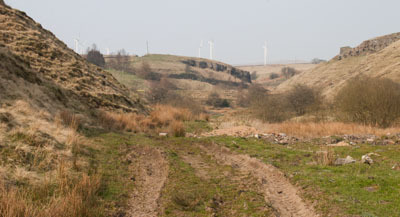 (A drier alternative to this might have been to continue ahead, following the track to the west of the reservoir and then take the first path on the right). Go through a metal gate and cross a bridge over the overflow channel. The path ahead appears to divide into two - in fact there are three routes. Follow the least distinct, which leads past the bushes at the left of the photograph and a telegraph pole. This path is very indistinct - and very wet in places. Make sure that you walk to the right of the tree pictured. 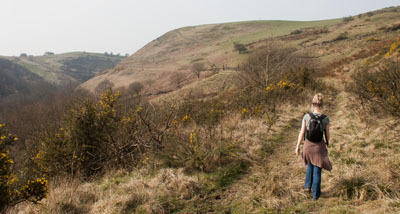 ... you come to a clearer track which leads up the valley to the west of the brook. 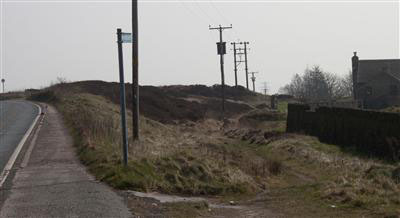 At Croston Close there is more evidence of the valley's industrial past. 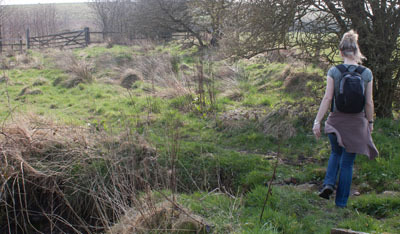 As well as former mill buildings there were cottages here. It wasn't just water power that was utilised at Croston Close - steam power was introduced in a bid to keep up with the nearby towns. 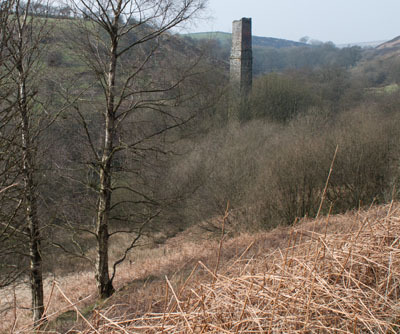 The picture shows the line of the flue from the mill boiler house to a chimney which stood on the hillside. 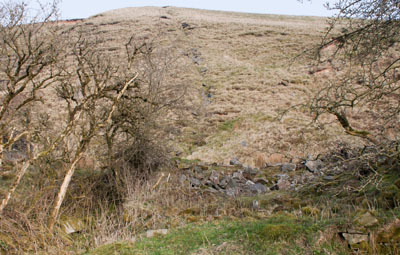 The path continues up the valley to the site of Cheesden Lumb Mill, which has the best preserved ruins. 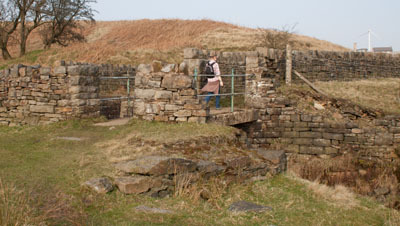 This small mill provides the best example of the layout of a waterpowered mill site, with the remains of a weir and a small, stone-sided reservoir. The axle of the waterwheel is reputed to still be in the wheel pit, but it was far to overgrown for us to see it on the day of our walk. Beyond the ruins, take the path on the right, which crosses the brook and leads between two stone walls. Continue to follow the path across a field. Where the path divides, take the right hand fork, leading to a wooden gate and steps. Climb the steps and turn right to walk along the road. We enjoyed refreshment at Own Betts before returning to our car.